The ports of Dumaguete, Cebu, Tagbilaran and Iligan have direct links to the Mystical Island of Siquijor via ferry or boat. Since, There is no direct flight from Cebu City to Siquijor. So I preferred to stay at Dumaguete. The fact, that I haven’t been to Dumaguete yet. I’d took a bus from Cebu South Bus Terminal via OSLOB-BATO going directly to Dumaguete. Since, I arrived Dumaguete late afternoon. I’d plan to do an overnight stay there and planning to go travel Siuijor the next morning. I stayed at Coastal Inn and they are the most cheapest inn in Dumaguete. Good thing about with this Inn is they are very closed to the port. When I arrived I was amazed their port. I can see the mystical beauty of their Island. It is like a little Boracay. Also, I was treated well by the the Tourism booth in Siquijor. It was really manned and there were people who will assist you thoroughly. I was so excited when everything was already planned about my Coastal Island Tour. The coastal tour in a trycicle would cost you PHP 1000. 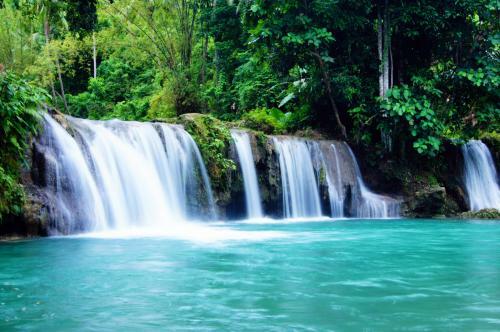 Siquijor is also well known with their natural springs. This spring park is open to public which is situated at the heart of San Juan, Siquijor. Also, this park is just right in the middle of the town plaza. This park has a playground, kiosk and booths which is perfect for family and friends who wants to have a picnic. The tranquil atmosphere of Capilay Spring Park makes it a very popular destination both for local residents and tourists. Don’t forget to include this place in your itinerary if you happen to go to Siquijor. Being a Filipino, we always believe that Balete trees are home of mystical beings such as “kapre” and the demon horse”tikbalang” (sounds so creepy). But, once you’ll see the mystical,huge and charming balete tree. You will definitely say; Not creepy at all. Aside from the mystical tree. My main itinerary is to dip my feet into a small pool that they called “FISH SPA”. It was indulging. The water is so clear and cool. Siquijor is not just known for adventure seekers. This Island is also for the people who wants a peaceful and tranquil trip. They have one of the oldest church in the Philippines which is the “Lazi Church”also known as San Isidro Labrador Church.The San Isidro Labrador Parish church was built in stone and hardwood by Filipino artisans. The church was finished in 1884 and the church bell a year after.Until now, it still holds mass and sometimes the priest takes you at the convent for a tour. Inside the convent, there’s a museum where you only have to pay for a minimal fee of about Php20 each. The museum contains very old religious artifacts and antiques like an old friar’s diary, wood-carved saints and other 19th century items. But take note, taking pictures are not allowed. 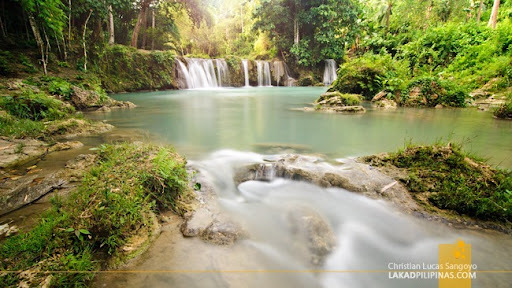 Cambugahay Falls is just one of the many tourist attractions in Siquijor. It is one of the many precious waterfalls in the Philippines wherein a great deal of tourist enjoys its fascinating ambience. Even locals within the island enjoy spending their time in the mystical waterfall together with their families. The waterfall consists of multi-layered cascading falls with crisp and clean warm water originating from natural springs, rain water and water sheds. Water from the Cambugahay Falls flows down about three kilometers downstream making numerous wonderful swimming lagoons before it discharges into the Lazi Bay. Most travellers amongst you have probably experienced the moment you reach the summit of a mountain or a top of a lighthouse and the view just blows you away. That’s exactly the same feeling I had when we walked down the steep stairs and when we reached the bottom, I was definitely blown away by its beauty. I am probably just exaggerating but I love white sand beaches very much so this is a real pleasant surprise. The sand was very fine and very white against the noontime sun. It was too hot to swim so we just laid down our sarongs underneath the limestone rocks and stayed there for a couple of minutes to relish the view. Probably the only thing that makes this beach a little unique are the limestone boulders scattered all over the sand. You can tell that it was low tide because the rocks had water marks on them and where we were sitting is submerged in water during high tide. Salagdoong Beach is one of the most popular beaches in Siquijor. This white sand beach located in the town of Maria has a very wide area. Its beachfront is separated by a small rocky hill (hummock) which you can climb to enjoy a better view of the whole beach. What I like about this beach is that, it’s not crowded and its entrance fee is very cheap (P25 for adults and P15 for kids). Okay, maybe because we went there in October 2011 which is a non-peak season? But we’ve been to other beaches here in the Philippines in non-peak season as well and none of them is as quiet and peaceful like this one (We’ve never been in Guimaras yet which I heard is less crowded also). If you want to spend the night there, the hotel in this resort (Hotel Agripino) has room rates ranging from P900 to P1,600. If you’re after a whole day excursion only, make sure to take note of these amenities—Cottage P100, Nipa Cottage P300 and Slide P50. Previous postRandom Thoughts: 17 Reasons Why People Should Travel. Next postBacolod; Is Indeed A Place That You Can Smile. Siquijor’s beauty is really enchanting and mystical. Love the long stretch of beach in San Juan, with the spectacular sunset. I love it.. on my bucket list ! This made me want to visit Siquijor again 😀.